Classification: Challenging. But there are many stop off points. The Taste Round the Island Cycle Route gives cyclists the chance to discover the Isle of Wight’s culinary delights whilst burning off those extra calories at the same time! The permanently signed route (dark blue with white island) leads you along country lanes, through towns and villages, avoiding the busiest roads wherever possible. The verges of some country lanes are maintained for the benefit of wildlife are not cut until late summer. The route was attempted by over 3000 people over the May bank holiday as part of the Isle of Wight Randonnee. The whole route in a day is a definite challenge, but the route is designed to be taken at a leisurely pace. Complete the entire course in a few days or sample a section of the Island on a day trip. The most calorie burning hills on the route are between Chale and Godshill but remember – these do reward you with some of the Island’s best coastal views. If you get tired of the hills, from Spring to Autumn you can let the bus do the climbs along the Southern coast. The Coaster bus has specially designed bike racks inside the buses. As you travel along the Taste Round the Island Route you will find numerous restaurants, pubs and cafes. 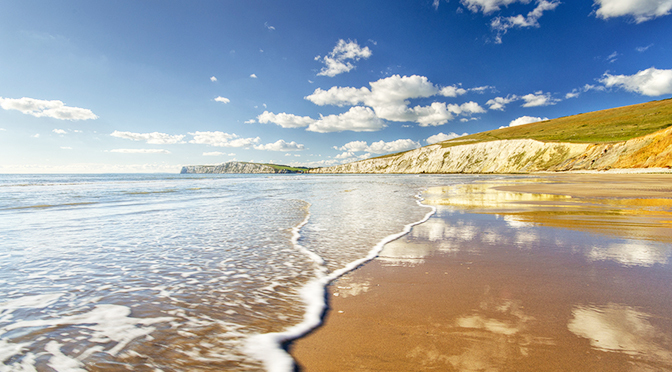 Many of these locations supply or serve tasty local produce to give you a real flavour of the Isle of Wight! The Round the Island Cycle route was first created in 1985 using the Island Wayfarer cycle Touring clubs Randonee route. This 100Km course is attempted by over 3000 people on the May bank holiday. The whole route in a day is a definite challenge, but the Round the Island Taste Cycle route doesn’t have to be that rushed.